To the bells chearful sound. And soon they all say. Such such were the joys. Seul poème tiré de Songs of Innocence dans le Volume 2. Deux traductions, deux interprétations . Les verrez au prè Tintant. Au milieu des vieilles gens. Nous allions au Pré Tintant. Ainsi nos jeux se terminent. Prêts à dormir ou dormant. 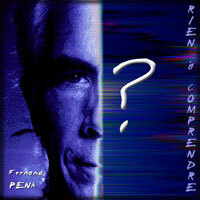 Car le pré va s'annuitant. traduction Pierre Leyris dans "oeuvres complètes"
Dans l’écho de la verdure. Et nos ébats touchent à leur fin. 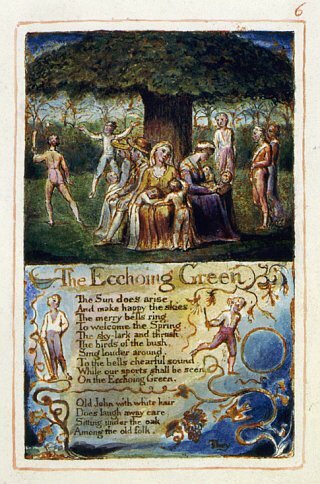 As I read through William Blake's poem, "The Echoing Green", I try to dig deeper into its meaning. To me, poetry has so much more meaning then what the words say. This unit is all about innocence and experience so I plan to find those two things in this poem. Also in this essay, I will analyze this poem to find its deeper meaning past what is already known. The poem starts out joyful and happy. It is springtime and the sun is rising to brighten up the sky. The birds are singing along with the ringing bells while the children are playing games out on the open field also known as the Echoing Green. The poem then turns to a man named Old John. By the name alone you can tell his is an elderly man. William Blake even makes it more obvious by telling you Old John has white hair. Old John is sitting under an oak tree along with his other elderly pals. It seems that the elders are watching the children play as they enjoy the shade from an oak tree. At this point in the poem it shifts to let you know that the narrator is one of the young children playing. As he or she goes on to say that the old folks will say, "Such, such were the joys when we all, girls and boys, in our youth time were seen on the Echoing Green." The elders are remembering their childhood days when they were the ones playing on the Echoing Green. It is here that I realize what the name "Echoing Green" means. 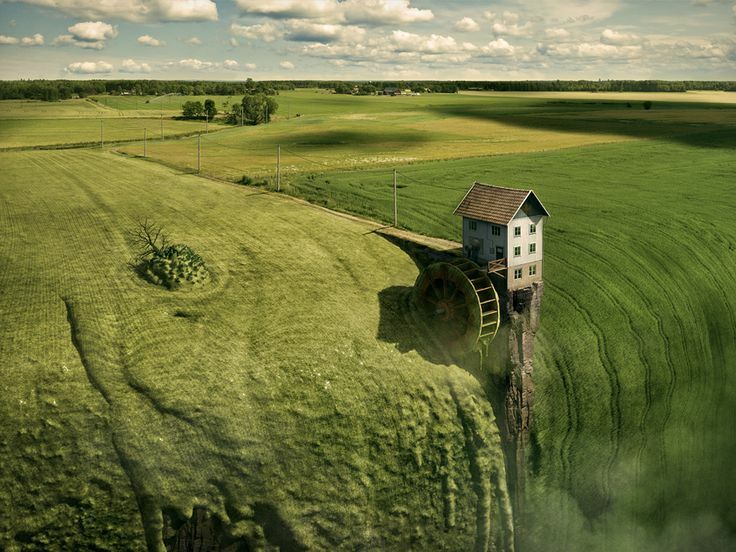 An echo is something that repeats and then fades away, and of course the green is the field of green grass. This field of grass is echoing the same thing every spring. The children are out playing and the elders are under the shade of an oak tree. Then the merriment of the day passes away when the sun starts to set. The children grow tired of running around all day and head home to their families. As nighttime falls upon the Echoing Green, there are no more games played, no elders out to rest. This is when Blake renames it the darkening Green. At first I felt this meant that this field of grass held some dark secrets. This still may be true, depending on how you read it. Now as I read it I think that it is simply the field receiving the darkness of nighttime as all the earth does. This poem is simple yet deep. It explains the joys of spring and also the statement that, "There is nothing new under the sun." I find this to be true everyday. The Echoing Green has seen the same thing for ages. From when the children are playing now, to when the elders were children playing, and etcetera. William Blake's poem just reaffirms that fact that everything we have seen and done today has already been done by another in a past generation. 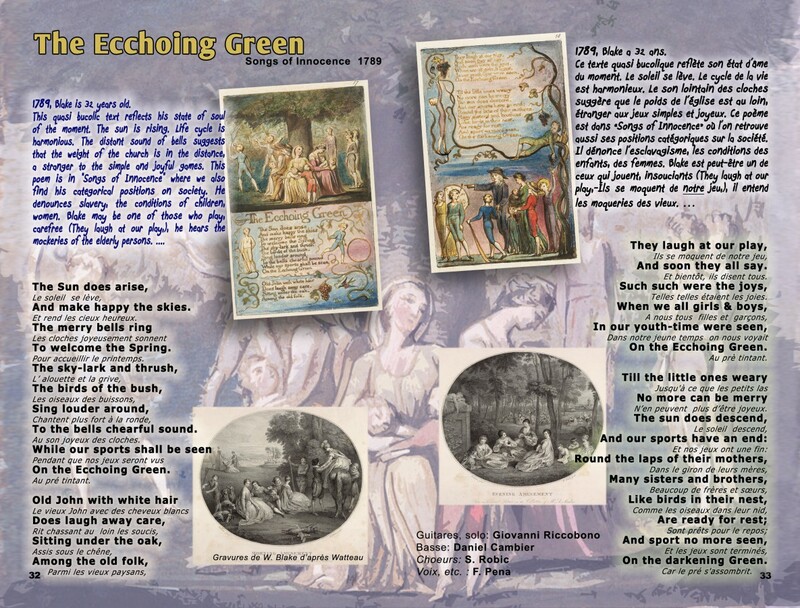 The poem, The Echoing Green is taken from the collection “Songs of Innocence” by William Blake. After, “Introduction”, we are set into a carefree world of alluring happiness. The Echoing Green turns out to be a bit different. Let’s get lost in the shouts of the playing children and the ringing bells. Blake paints many a beautiful pictures though his poetic verse to provide a vivid imagery of the Spring, the swiftness of the fresh air and the magic of blazing sun. 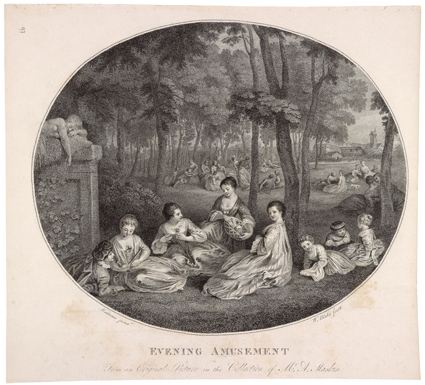 Amidst the pleasant shouts of the children, the poet introduces characters like old John with white hat; the character seems to play a significant role in the development of the theme of the poem. In the eighteen century children were regarded as miniature adult. 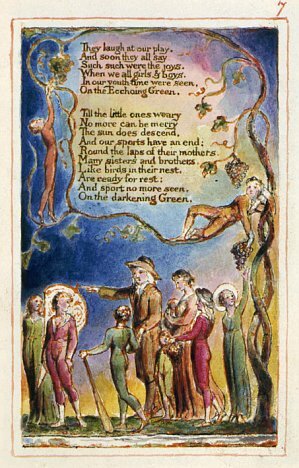 The poem really extends a one sided feeling from Blake’s end who portrayed children as they are. 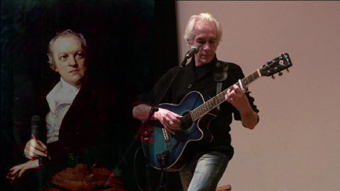 Much with gay, purity and joy, Blake introduced the element of security (the need of a guardian) by the introduction of “old John” with “white hair”. 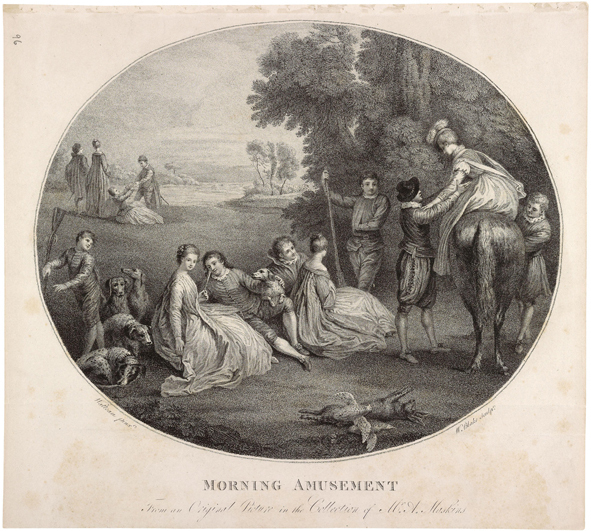 Though the character is a sheer necessity in the poem, it well supplements Blake’s thought of having someone old enough to have a look at the children (since they are children, and not miniature adult). The poem is set to be in running verse with a high momentum which readers may have difficulty to grasp, initially. However, the simplicity of the verse makes life easy! The first stanza of “The Echoing Green” presents a beautiful countryside view which welcomes the advent of the spring (mark the words, sunny sky and ringing bells). The poem possess elements of festive delight accompanied with the echoing shouts of the sportive children. Here we see the skylark’s vibrant singing and the old man’s stimulation to ruminate his own childhood. Proceeding to the third stanza, the picture becomes grave and things turn weary. The old speaks of the old age which needs more care and is symbolized through “round the laps of their mothers” and “are ready for rest”. The poet draws our attention to the empty valley in the last two lines with no more echoes! The echoing green analysis would be incomplete if we fail to understand the idea of the spring, as conveyed throughout the poem! The radiance of the sun and the florid sky sets the smell of April. Only a poet of Blake’s authority can create such a wonderful background in simple verse, yet preserving the substantial theme of the poem. 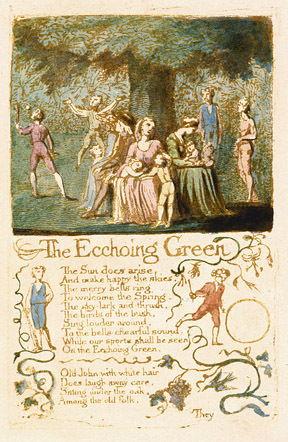 Symbolism is associated with every poetic composition of Blake, and the same goes with the Echoing Green. The first stanza highlights the happiness of childhood. It’s during the period of childhood that one is powered with the God given intuition to perceive every natural object through the eyes of God. The word ‘Echo’ has a special importance! Green apart from signifying the scene of children’s sport refers to happiness and mirth of childhood! If we go by the very definition of Echo, the poet actually wants to convey the message, the very happiness of the children (through sports or any other action) echoes around their family members, and in turn they become happy, just by seeing the children play. Blake introduces an old man in the very proximity of the green valley to further intensify this thought. The old man may be the grandfather of any child playing, or he simply may be a local with others accompanying him. The poet clearly and confidently picturize the old man’s nostalgia; the evergreen sweet reminiscence of childhood. ‘The Dark’ and ‘ascending sun’ denotes old age. Old age hinders the sportive spirit; as all slowly get ready for rest. The phrases “sports have an end” and “ready for rest” sways the mood of the poem to that of unmixed sorrow/joy. The poem is filled with imagery. As if we can see every scene, every action happening in-front of our eyes. Blake is the only poet ever produced in the history who can create so many scenes with so less words. The tone is childish, soft, gentle and imbibing. There is a strong flow of contentment in the tone dipped in an atmosphere of mirth. Nature’s mirth is expressed in the poem keeping in the mind the human cycle. The poem consists of dual theme. 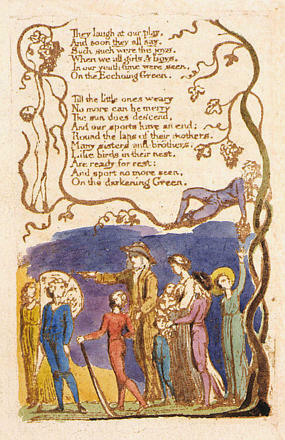 The theme of Nature; Nature is vibrant and dynamic in this poem of Blake. The other closely relates to the human life cycle, illustrating the rising and setting of life. Blake’s idea was to portray the ‘rising and setting’ of human life amidst the colourful vibes of Nature. Sorrow is not highlighted anywhere and that is why the poem is in the “innocence” section. Comme je l'ai lu William Blakes poème, The Green écho, j'essaie de creuser plus profondément dans son sens. Pour moi, la poésie a beaucoup plus de sens alors ce que les mots disent. Cet appareil est tout au sujet de l'innocence et de l'expérience donc je prévois de trouver ces deux choses dans ce poème. Toujours dans cet essai, je vais analyser ce poème pour trouver son sens profond delà de ce qui est déjà connu. Le poème commence joyeux et heureux. C'est le printemps et le soleil se lève pour égayer le ciel. Les oiseaux chantent avec les cloches pendant que les enfants jouent à des jeux sur le terrain ouvert également connu sous le vert écho. Le poème se tourne alors vers un homme nommé Old John. Par le seul nom que vous pouvez dire le sien est un homme âgé. 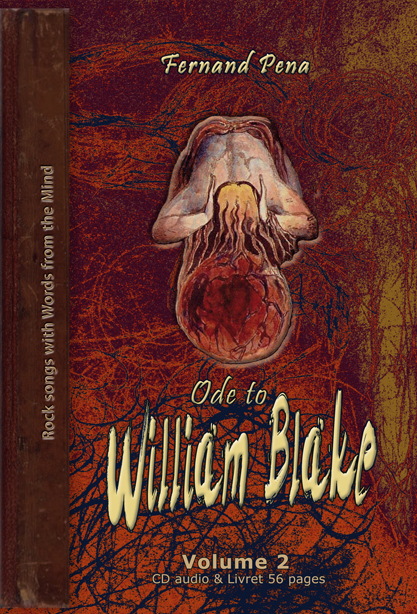 William Blake le rend encore plus évident en vous disant Old John a les cheveux blancs. Old John est assis sous un chêne avec ses autres potes âgées. Il semble que les anciens regardent les enfants jouent comme ils apprécient l'ombre d'un chêne. A ce stade, dans le poème, il se déplace pour vous faire savoir que le narrateur est l'un des jeunes enfants qui jouent. Comme il continue à dire que les vieux vont dire, par exemple, tels étaient les joies quand nous avons tous, filles et garçons, à notre époque, des jeunes ont été vus sur le vert écho. Les anciens se souviennent de leur enfance quand ils étaient ceux qui jouent sur le vert écho. C'est là que je me rends compte que le nom faisant l'écho des moyens de vert. Un écho est quelque chose qui se répète et puis s'estompe, et bien sûr le vert est le champ d'herbe verte. Ce champ d'herbe se fait l'écho la même chose à chaque printemps. Les enfants sont en train de jouer et les anciens sont à l'ombre d'un chêne. Ensuite, la gaieté de la journée décède quand le soleil commence à se coucher. Les enfants grandissent fatigué de courir toute la journée et la tête à leurs familles. À la tombée de nuit sur le vert écho, il n'y a plus de matchs joués, aucun des anciens pour se reposer. C'est alors que Blake renomme le vert s'assombrit. Au début, je sentais que cela signifiait que ce champ d'herbe tenu des sombres secrets. Ceci peut encore être vrai, selon la façon dont vous l'avez lu. Maintenant, comme je l'ai lu, je pense que c'est simplement le champ recevant l'obscurité de la nuit que tout le monde le fait. Ce poème est simple mais profond. Il explique les joies du printemps et également l'affirmation selon laquelle il n'y a rien de nouveau sous le soleil. Je trouve que cela est vrai de tous les jours. The Green écho a vu la même chose depuis des lustres. A partir de quand les enfants jouent maintenant, au moment où les anciens étaient des enfants qui jouent, et cetera. William Blakes poème réaffirme simplement le fait que tout ce que nous avons vu et fait aujourd'hui a déjà été fait par un autre dans une génération passée.